LOVE's Haven: What Approval Do You Need If You Are Thinking of Digging In Your Yard? What Approval Do You Need If You Are Thinking of Digging In Your Yard? There is a big difference between normal digging that you would do in your yard and digging in a way that will make significant changes to your yard space. There is no reason to get permission from anyone if you just want to plant a few shrubs but if you want to dig the foundations of a new structure you should always check with your local council first. We are going to examine why it’s so important to get council permission before you dig. We are also going to take a look at what else you may need to think about before you start digging in your yard. Why is getting approval so important? 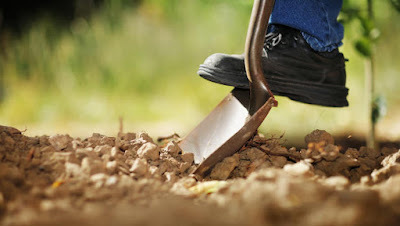 If you are going to undertake a digging project in your back yard you do not want to take the chance of all the effort being wasted. This is what could happen if you do not get the correct permission you need before you start out on the project. You may be tempted to just go ahead and hope for the best, but this is a risky tactic. If you do not have the permission you need you could be asked to return your yard to its original state at some point in the future. You do not want this to happen after you have invested a lot of time and effort carrying out the work in the first place. If you have any doubts about what permission you need you should approach the council. You may also want to hire the services of a professional surveyor to carry out a contour survey. These professionals are experts who can also project manage your work for you so that you know you have all the right permissions in place. Before you dig in your back yard it’s helpful if you know what sort of obstacles you may face. It’s important to remember that there may be structures underneath the ground that you are not aware of; such as utility pipes. The last thing you want to do, while digging, is to hit a gas main or a water pipe. You could end up creating a very dangerous situation, or flooding your yard. This is another reason why surveying work is important; it helps you to know about any issues so that you can plan accordingly. You should never just start a digging project in your yard without making sure you have the permission to do so. If you need help knowing about permissions required you can approach the council yourself or you can hire a professional to manage the project for you. It’s also important to plan before you dig, and find out about any problems you are likely to encounter. If you do this you are not going to be faced with any nasty surprises which delay the project and increase expenditure.